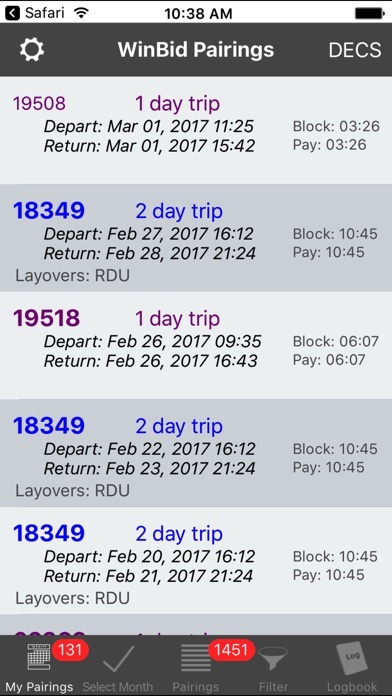 WinBid Pairings 2 is the all-around trip organizer for airline crews. ** Supports ONLY the following airlines **: - AA Pilots and flight attendants - all crew bases, aircraft Contact developer to add support for your airline • All pairing times are in crew base local time. No need to calculate timezones. 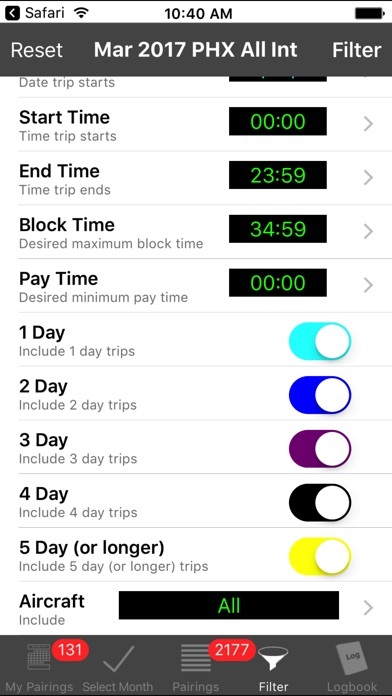 • Download entire pairing packages for your aircraft and crew base in seconds • Select pairings as your pairings, where crew names, notes, departure/arrival gates and passenger loads can be permanently saved • Display your pairings on your Apple Watch • Filter pairings that match your parameters • Logbook feature to maintain a legal logbook with instant totals for recency (includes FAR 117 reporting) • Seed logbook legs with your pairings (only make minor changes for actual time etc.) • Import logbook from Little Red Book from WinBid (Windows) • Import personal and split pairings from WinBid (Mac/Windows) • Easy setup – nothing else needed (stand-alone, WinBid desktop not required) • Using iTunes file sharing, import pairings, crew names, notes from the desktop version of WinBid (Windows, Mac) • Redesigned interface for quick and easy access to all features • New table format for viewing all pairings, with optional theme colors (or select traditional text format) • Scheduled pairings shared with WinBid Mac, and WinBid Schedule (iPad and Windows) • Logbook shared with WinBid Logbook on Mac as well as WinBid Logbook iPhone, and Windows • Built-in DECS features, including DECS schedule and pairing commands. Import pairings directly from DECS (support for pilots only) • Includes Instant DECS with plain English menus: no arcane commands and inconsistent formatting to remember (support for pilots only) • Includes DECS HISEND without archaic form selection etc. (pilots only) • No charge for monthly downloads. No recurring fees. Update 4.2 killed off DECS for Flight Attendants. Don’t understand why because LUS FAs had limited use but you could pull crew names and hotel assignments. I would have skipped the update if I knew this was going to happen. 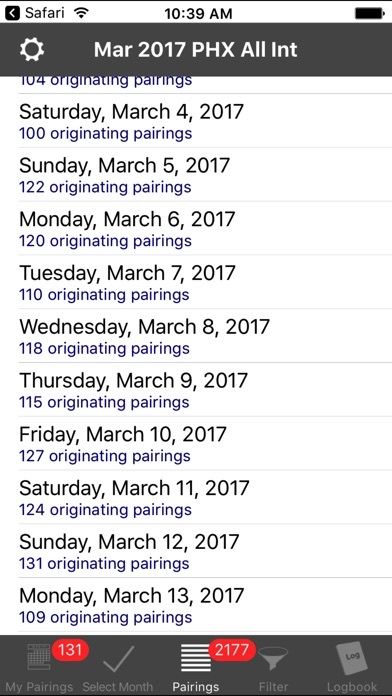 Great app for searching pairings. Would love for more search filters to be added, like layover city (find all MSY layovers on a particular day). Love how it adds loads and gate info. Helpful app for a one time price. Pretty good app ! The only problem with it is not being able to switch to station times . Seems like an easy fix . Pulling up pax loads works half of the time . I get a time out error most of the time . This app is a tremendous help throughout the year, I rarely print a trip sheet anymore, I'd always lose them anyway. 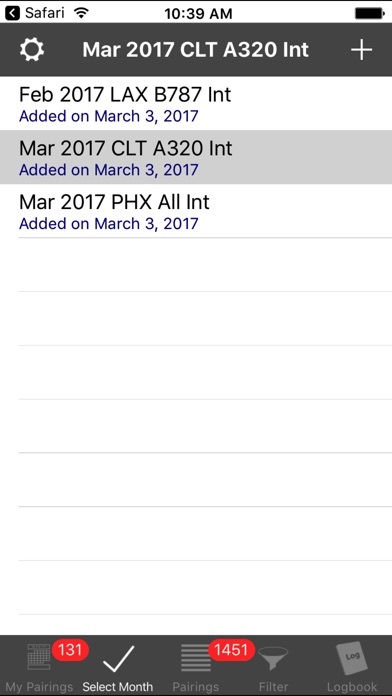 It's even useful during tax time for tracking layovers. Only thing I'd like to see in a future update is the swipe to go back to previous screen that iPhone has available for apps now. Awesome app! It was always helpful for LUSers in bidding and trip info. Now with new DECS features it again is my go to app over the CCI and APA app interfaces. Thank you! Great thorough tech support as I worked thru some issues previously with some bad iPhone settings I had. The creator of this app got in touch with me and cleared up some of the problems with it. It is a way to relay the information he gets from the airline in an easier to read view. Please remove my previous review as the creator has taken care of it. I loved this app but then 6-8 weeks ago the "Update Gates" feature stopped working. This is one of the main features that I purchased this app for, without it, I feel it's lost much of its functionality. Besides, I purchased this because it alone does what to three other apps/websites do however, now I have to open another app to find out gate info! Customer service has been prompt however, they could not solve my problem, Nor did they offer any solutions or tell me when the problem would be fixed… In addition, I wasn't offered a refund of my money and this is an expensive app! Overall a nice upgrade for the f/a group. The filtering system is a little frustrating when you are used to the old way. Other than that, it is a very useful app. The most frequently used app second to email and Facebook.